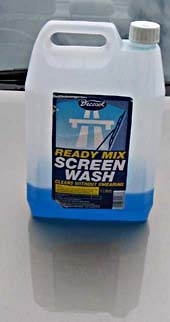 Large containers holding around a gallon of liquid are available with car products such as "windscreen wash" or "de-icer" and engine oil. You can rinse one of these and fill it with warm water, to keep you warm in winter, or cold water (or crushed ice) to keep you cool in summer. Most bottles have a cardboard lid seal which doesn't last long so beware of leaks! 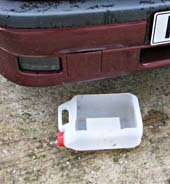 If you cut the side out of a gallon container, you have a quick "hand basin" for emergency use or a container for when hubby decides to drain the car engine oil. When draining is complete, carefully unscrew the cap and pour the oil into another (complete) container for disposal. You can also use it to keep tools or small jars together in the workshop or shed. 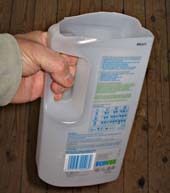 Smaller bottles are available with detergent and laundry products. These have a number of uses and many have a handle which can be retained for ease of carrying. If you use sharp scissors to cut away the top section, including the screw cap but leaving the handle in place, you have a handy "jug" for storing messy paintbrushes, knitting needles, remote control zappers, liquid, dry cat food, herbs, flowers, knitting needles and lots of other items. 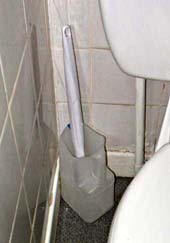 You can even use this to hold your toilet brush. It can either be cleaned regularly or discarded and replaced. It's free so you can throw it away! Another use for complete bottles: use them as lightweight packing if you have something large to send in a box. Collect a few empty plastic film-roll containers from your local photographic shop (take a bag). They usually trash them so they'll thank you for taking them away. You can use them for storing things like pins, needles, screws, toothpicks, Band aids® (Elastoplast®), jewelry (jewellery), jelly (jam), nuts or seeds (for a snack), butter, buttons, face cream, silicone grease, Blu-Tack®, hand cream, tissues, petroleum jelly (Vaseline®) ... to keep in your purse (handbag) for emergencies.